New York City: home to world-renowned museums, theater, restaurants, iconic sports franchises. Central Park. Wall Street. And an infamous serial killer who's terrorized the Big Apple for decades.The year is 1995 and the NYPD has just graduated a promising new patrol officer named Karen Vail. The rookie's first day on the job is anything but easy when she finds herself at the crime scene of a young woman murdered in an unusual manner. Vail is unsure of what she's looking at or what it means--but it's a case that will weigh on her mind for nearly twenty years.As the years pass, Vail's career takes unexpected twists and turns--as does the case that's come to be known as Hades. Now a skilled FBI profiler, will Vail be in a better position to catch the killer? Or will Hades prove to be Karen Vail's hell on earth? As you can probably tell, I have been doing a lot more reading lately so I have a lot more reviews to share with everyone. And boy have I been reading in varied genres and have been reading some good ones. 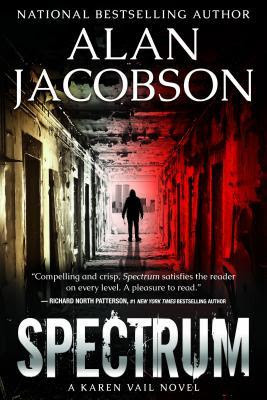 SPECTRUM, which is the sixth book in the Karen Vail universe, is one of the good ones. It is almost a prequel since it relates to the first case she caught back in her rookie days with the NTPD. Notice that I said almost? It jumps back and forth in time with just enough info about what is happening at various points in her life that I am really intrigued by this universe and will have to check out the other five books. This book is really hard to classify in a genre because I would call it suspense or even a thriller though there are very few edge of the seat moments since a lot of it occurs in the past. It's more a puzzle where you are given all the pieces and you get to try to put them together before the conclusion (which does have some tense moments). Even so I was caught up in the case shown from both Karen's point of view and overviews of possible suspects lives. I really enjoyed this book and it was a wonderful introduction to this world and to Karen Vail. I think that my readers who enjoy police procedurals and suspense will find it satisfying.